Extraterrestrial civilizations indicate on a very close beginning of the real events of global cataclysm scenario - uncontrollable super-strong natural phenomena. On the way of two pre-cataclysms are located many nuclear power plants. This is the real threat to the life of mankind. However, the direction of the blow can not be changed – it is determined by characteristics the magnetic field of Earth. Extraterrestrial civilizations suggest before the first pre-cataclysm to make the Transition in the next cycle of life. Moreover, after simultaneous failure of many nuclear power stations life on Earth will become impossible. Thus, mankind expects on December 21, 2012 some events due to the end of the Mayan calendar. However, this is just a very bright shining lighthouse of warning - Extremely dangerous! Stay away from this date - this is the beginning of the scenario of global cataclysms. The main blow of two pre-cataclysms will be directed to the east coast of North America, where it are placed many nuclear power plants. . It is possible that the direction of the blow will spread to the coastal parts of the Western Europe and East Asia, where also are placed many nuclear power plants. Shadow effect of slipping on the pyramid Kukulkan dragon in the year of the Dragon 2012 points on close beginning of the scenario of global cataclysms – super-strong uncontrollable natural catastrophes, to which is impossible to adapt. The only way - to make the Transition to a safe level of the material world into a new cycle of life. World map with the first pre-cataclysm direction and the location of nuclear power plants of about 480 total number! The scenario of the beginning of global cataclysm was already known several thousand years ago and is vividly presented to earth dwellers in the complexes of extraterrestrial civilizations. However, mankind could not have read this information because they do not understand the symbolic of consciousness. As it turned out, on the whole direction of two pre-cataclysms are built a huge number of nuclear power plants that provide livelihoods of people living in these areas. However, the scenario of events is already known, and two natural blows will pass just in this direction and on this territory. This is due to the features of magnetic field of our planet. Extraterrestrial civilizations indicate that the epicenter of these pre-cataclysms will arise in the South Atlantic Brazilian anomaly - the weakest magnetic field of the planet. Humanity already has the bitter experience of the sudden destruction of nuclear power plants. One of them happened in Japan in March 2011, when under the tsunami blow was a nuclear power plant Fukushima. Significantly greater tragedy is associated with Chernobyl. It happened in 1986 in the USSR. Human tragedy of Hiroshima and Nagasaki, we simply must NEVER FORGET! Considering all of it, the German government officially refused from nuclear power and decided to create a new, more secure energy sources. The government's decision to move to non-nuclear power industry has accelerated by the accident at nuclear power plants «Fukushima-1» in Japan. Near future present to us an entirely different picture. After the first pre-cataclysm would be destroyed not one, but a lot of nuclear power plants located in areas prone to the first natural blow. The consequences of radiation affect on the environment would be threatening. Therefore, mankind has to make the Transition immediately after the first pre-cataclysm, and the time for the hesitating will be gone. The first pre-cataclysm in accordance with the scenario of extraterrestrial civilizations will be caused artificially, so the natural phenomena will not foretell in advance about its occurrence. It will arise unexpectedly, and all natural phenomena and the effects corresponding to its incredible force will arise together with it. Even the forecasters «do not see» the first pre-cataclysmor, more precisely,do not know,what cataclysm will be the first -nor Edgar Cayse, talking about the natural blow on the territory of North America, no Nostradamus, informing about the cataclysm of the Red Cancer. There is an unknown to humanity feature of work of consciousness. Each level of human consciousness corresponds to a certain density of thoughts. For example, we-humanity with carbon base live at the level of Crystal Structures and have very dense body. Extraterrestrials for teleportation-flights in the universe, realized through the parallel worlds, transform their body into holographic, which however has weight. We soon will make the Transition to the Highest level of the material world, where we will also have holographic body, but without weight. So, at least there are three states of a body – dense; holographic with weight and holographic without weigh. This state of a body is determined by the level of the material world where it is located. The same are thoughts. We live at the level of Crystal Structures and can not travel in the universe, because our level of consciousness does not allow a body to transform. Our thoughts-images are very, very dense. They are easy to read. In process of consciousness development civilizations start to live not in individual mode, as we do, but in the united mode of consciousness. The united consciousness creates the mutual understanding and the mutual assistance based on constant merge of brain areas of cells and information interchange. So, from this moment begins flights in the universe, because their consciousness allows constantly transform a body for teleportation flights by making transitions between sublevels of Intermediate level of the material world. With increasing flight distances, which is determined only by the level of consciousness, their thought-forms are thinning. Extraterrestrials with highest level of consciousness for a long time flying through the universe help us to make the Transition to the next cycle of life. Therefore, their thin thoughts-forms are very difficult to read by our Earth consciousness – consciousness of predictors, because do not have the proper degree of materialization. Three pre-cataclysms are artificial and already during millennium stand on the way of time, forming well-known scenario of « the beginning of global cataclysms ». However, these artificial events are very difficult for the perception by our consciousness. That’ why people of Earth live so freely, without feeling extreme danger hanging over them. That’s why even famous foretellers whose consciousness differs by the highest sensitivity to images of causality (cause and effect relationships)events do not feel the beginning of global pre-cataclysm scenario, i.e. start of the first, second and third pre-cataclysms. Predictors see the consequences of nuclear catastrophe from the first pre-cataclysm in the form of the huge destroyed territories and even perceive the high level of radiation, widespread from the damaged nuclear plants. The real event itself «the first pre-cataclysm» they see only in part. 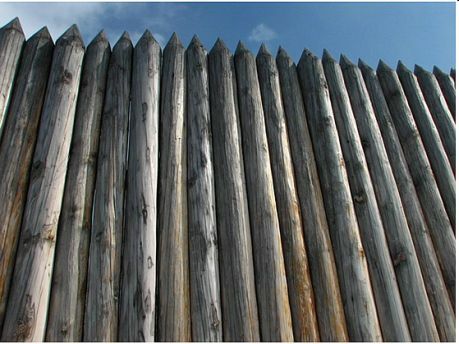 Predictors do not feel also the end of the cycle of Consciousness associated with the beginning of a global cataclysm, the palisade standing on the road of time. On Earth, in the near future will happen big and deep changes. There will be events that will force humanity to unite consciousness and make the Transition. These events will drive us to a standstill and force to jump. Is not it easier to do everything carefully and calmly in advance? No radiation, no despair, which will be cause by global contamination of the planet and a severe struggle for survival. If mankind has heard the call of extraterrestrial civilizations, and made the Transition before the first pre-cataclysm! Unfortunately mankind, in the principle, does not need these calls. Humanity does not want to hear about it. The Transition is a very easy process, we only need to understand it and practice. From the first time we are unable to cause the laser beam, just because we do not have experience. However, it is very easy to get this experience through training. Training can be carried out after work or study at a convenient time. Indeed, today many millions are involved in meditation and unite consciousness for different reasons. We need to start right now training for unification of consciousness by the countries and continents with the goal of the Transition for continuation of life. We have to form the groups of people, and gradually increase them. In the Transition before the first pre-cataclysm should be interested people of the whole world. Now is a time for the Transition and it should occur. We have not to be afraid of change, but have to go towards them. It is necessary to listen to the World, to understand and accept it – today very many are amazed by disbelief. Humanity has to understand what is really going on, and only in this case it will be able to continue living. The most important qualities in relationships of people today are understanding of upcoming situation, calmness and kindness. It is necessary to stop people who do bad to others. Love - is what will help us to survive and cause the laser beam for the Transition. However, love should real, sincere and we have to be ready to support each other in the most difficult circumstances. Causing the laser beam, we will open the future and realize with a smile that it is very simple. After the first pre-cataclysm would be broken communication - telephone, Internet, and others. There will be no electricity in many places. Humanity will require considerable time to recover. However, we must hurry to make the Transition before the second pre-cataclysm, as it happens shortly after the first one. About this inform the dates of the three pre-cataclysms, separated by short intervals of time: 21-22 September – March 22-23 – June 22-July 22. However, which one will come the first is still unknown. Will be remained quite short time for training for the unification of consciousness for the Transition. The rapid spread of high levels of radiation into the environment will have a huge impact on human health. Great complications arise. No part of the Earth is going to escape either the effects of the first pre-cataclysm or consequences after it. Through the united consciousness we need to form a common cell of mankind, the family of the many nations with a common destiny, united by a common goal. It is this homogeneous resonant medium of consciousness of civilization can cause the laser beam for the Transition. The Transition of humanity to the Highest level of the material world in the next cycle of life is very unusual for us. It is impossible to make the Transition directly from the level the Crystal Structures. The Transition contains two phases. The first phase of the Transition – the destruction of a body at the level of global cataclysms by a laser beam, which would cause the united consciousness of humanity. The second phase of the Transition – The General resurrection on the Highest level of the material world. It will happen like the following. After destruction of bodies of people of Earth civilization at the level of the Crystal Structures, the area of the Information world, corresponding to common cell of Earth humanity will transfer into the material world, on the Highest level, revealing by holograms of Resurrection. And humanity will arise again. At the Highest level will begin a new cycle of life – the cycle of Corrections – hell and paradise, and everyone will be responsible for the actions made today. Destruction of the body by a laser beam at the level of Crystal Structures where we live today, represents a special symbol. In all presented above complexes informing about the Transition this symbol is shown by numerous small steps, covering constructions from top to bottom. In some complexes this symbol is shown by numerous radial strips. Extraterrestrial civilizations presented a great process of unification of consciousness of the Earth civilization - 7 billion of people - with the common goal of the Transition due to the beginning of global cataclysms in many monumental complexes. The civilization of Earth is presented by the«Band of Holes» in Peru, with over 6.900 perfect holes about a meter in diameter each, forming countless rows. Earth civilization is depicted by the endless columns of columns-Thousand Warriors at Chichen Itza and Tula complex in Mexico. This is the perfect rows of thousands of stones of Carnac in France and many Dancers, holding hands on the murals of the pyramid of Huaca de la Luna in Trujillo, Peru. This is moai standing on ahu on Easter Island, Chile and many others pictograms. 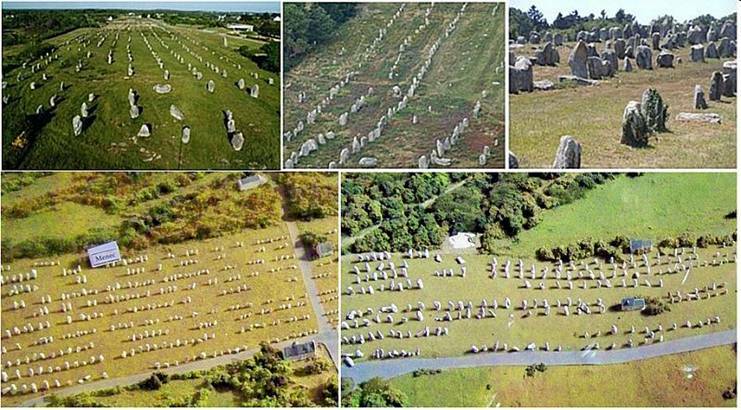 The unification of consciousness of Earth civilization depict an ideal rows, consisting of thousands of stones of the world-famous complex of Carnac in France of the Neolith epoch. This way is shown millions and millions people of civilization, uniting consciousness for the Transition. They look like ideal rows of Roman legions. The unification consciousness of the Earth civilization portray countless columns of the Thousand Warriorsin the complex of Chichen Itza in Mexico. About unification of consciousness also informs complex of Tula. Humanity is represented by multiple columns. The unification of civilization’ consciousness is also represented in other complexes of extraterrestrial civilizations. The unification of consciousness of the Earth civilization is depicted by many «dancers» holding hands on the murals of the pyramid of Huaca de la Luna in Trujillo, Peru. The unification of consciousness of the Earth civilization represent many moai on the ahu platforms, the Easter Island, Chile. Incredible demonstration of the unification of consciousness of the Earth civilization for the Transition is the Band of Holes in Peru. It is located in the mountains not far from the Pisco Valley in the place Cajamarquilla in Peru. Length of the Band of Holes is approximately 1,450m and its width is about 20m. The Band Holes consists of 6,900 ideal man-sized holes about one meter in diameter. Holes form countless rows and each of them has eight holes. The number «8» means the four pairs of people, uniting consciousness. These 6,900 holes in rows carved into the barren rock represent 7 billion of people of Earth’ civilization uniting consciousness. At the very northern part of the Band of Holes, where it suddenly ends, is located a strange unnatural darkened area in the form of an oval. The researchers note that it looks like the remnants of the explosion. This is really so. By this strange dark area at the end of the Band of Holes extraterrestrial civilizations have shown the consequences of the first pre-cataclysm, which will cover the entire planet. The life path of humanity after the first pre-cataclysm will be interrupted by high level of radiation as a result of destruction of numerous nuclear power plants. The oval shape of the dark area in ETCs symbolic of consciousness represents the symbol of a pointed oval of the Transition. The Transition is the only way of mankind’ salvation. The oval is formed by unification of humanity consciousness. This is indicated by eight holes in each row of the Band of Holes. The direction of the Band of Holes from south to north-east corresponds to the direction of the main blow of one of pre-cataclysms. The second stage of the Transition - the General resurrection of humanity at the Highest level of the material world is represented in many complexes of extraterrestrial civilizations. The General resurrection of humanity at the Highest level of the material world portray Atlantes, installed on top of the main pyramid of Quetzalcoatl in the complex of Tula. On the lower back of each Atlas in a huge circle, depicting a cell of the united consciousness of humanity, is presented the image of Chac Mool. This way is shown the initial state of human being living today on the level of Crystal Structures. As the result of the Transition to the Highest level of the material world with other space-time parameters the body transformation happens, and the man Chac Mool converts into a 5-meter Atlas. Tremendous height of Atlantes shows the transformation in the human body on a new level. Big ears of Atlantes and Chac Mool have identical form. They tell that only humanity informed about the coming cataclysms and heard the warning of extraterrestrial civilizations, will continue life at the Highest level. About the same tell huge ears of the Easter Island moai. Crown-cap of Atlas, representing the brain area of the united cells of mankind if ornamented with numerous hexagons placed on a height in several rows. Hexagons tell, how was formed this crown-cap on the head of Atlas. These are brain areas of individual cells of Earth people with carbon base. These are people of our civilization, seven billion, who through the united consciousness made the Transition into the next cycle of life and became the Atlantes. Many feathers in the headdress of Atlas indicate that mankind has already made the Transition-flight. On the other hand, long, narrow rectangles that resemble feathers, ending headdress, represent a shift of the brain area in each cell of people of Earth, i.e. in each individual. Brain areas of the cells of individual consciousness of people are depicted by small squares just below the long, narrow rectangles. This way is shown the acceptance of the uniform decision about the Transition of Earth civilization. Regeneration of mankind at the Highest level of the material world as a result of the General Resurrection, portray numerous high column, installed at the top of the temple of a Thousands Warriors. The columns that rise up the stairs of the temple of a Thousand Warriors in the complex Chichen Itza, as well as on the stairs of the pyramid Quetzalcoatl, Tula, show to mankind the way of the Transition from the level of the Crystal Structures on the Highest level of the material world for continuation of life. Two rows of columns rising on the stairs of the temple of a Thousand Warriors in the complex Chichen Itza, as well as two pairs of columns, ascending the stairs of the pyramid Quetzalcoatl, Tula, indicate on the transition which happens as a result of unification of mankind consciousness. The way of mankind in the next cycle of life completely repeats the stages of the legends about immortality and resurrection of the fiery bird Phoenix, which symbol she represents. The fiery bird Phoenix is considered to be a symbol of rebirth of a human, his released soul. Legend about the fiery bird Phoenix. An ancient legend tells that the bird Phoenix lives 1000 years. Then, foreseeing his own death, Phoenix makes a nest from a noble tree, and when the nest is ready, before his death, Phoenix burns himself with his nest full of aromatic herbs, in order to revive from the ashes again. So, young resurrected bird Phoenix once again begins his life cycle in 1000 years. Phoenix has five colors which symbolizes the five virtues. Phoenix and Dragon. Phoenix is often depicted together with a dragon. In this case, these two symbols represent the union, «inseparable union», in which the Dragon represents the imperial power, and the Phoenix — symbolizes the empress. However, this union isn't limited to a married couple, but symbolizes the universal interdependence of yin-yang duality in the world of duality. Phoenix, like the dragon, consists of various elements representing the entire Space: he has a rooster's head (the Sun), the back of a swallow (a symbol of the increasing Moon), its wings – the wind, a tail symbolizes trees and flowers, his feet — the earth. Phoenix in myths and legends of many people. Legends about miraculous fiery bird Phoenix which revives after death, are presented in mythology of many people. In Egypt it is a bird of Ben, Simurg in Iran, in India — Garuda, Kerkes in Turkish mythology. For Christians the Phoenix symbolizes a victory of eternal life, a victory over death, the resurrection from dead, therefore is a symbol of the Christ. Ancient Greeks considered the Phoenix as a symbol of a rising sun and the newness life through a fiery death. 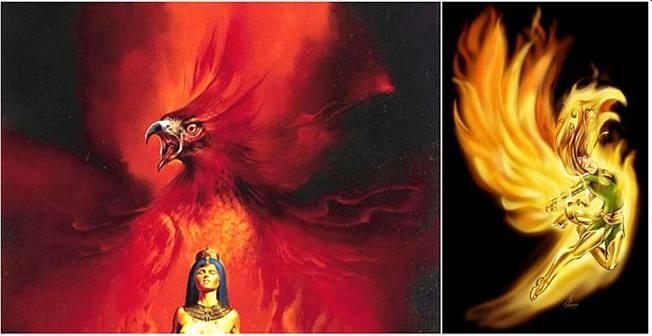 In Egypt the Phoenix was associated with God Ra, as a symbol of the solar beginning, resurrection and immortality. For Japanese the Phoenix symbolizes the sun, and also justice, obedience and fidelity. In China the Phoenix (Fan-huan) or «a red bird» is considered to be the emperor of birds. The bird personifies both the yin and yang, while the fiery bird is considered a male. As the Phoenix is a solar symbol or a fiery bird, it symbolizes the authority given by God, as well as humility and mildness, faith, a constancy and uniqueness. 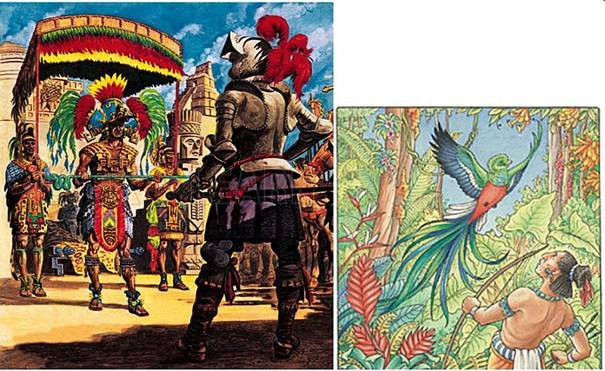 Decoding the legend about the bird Phoenix. From the point of view of symbolic of extraterrestrial civilizations, the legend about the Phoenix tells that mankind lived on Earth for a long time, improving consciousness. However, at some point on the planet comes time of global cataclysms. Mankind learns about it from pictograms of extraterrestrial civilizations and understands that inevitable death will happen if humanity does not make the Transition in the next cycle of life. The symbol of global cataclysms in symbolic of consciousness of extraterrestrial civilizations is the Dragon, together with whom often is portrayed the Phoenix. The threat of approach of global cataclysms causes in mankind necessity to find a way to save lives. The bird Phoenix rushes to help people who find themselves in mortal danger, in order to show the only way for the continuation of life. The Phoenix and Dragon really form an inseparablecommunity, because just the Dragon-global cataclysm compelsmankind to repeat the way of Phoenix and to make the Transition. For the Transition all civilization should unite consciousness. The formation of united consciousness is transferred by words that «the Phoenix builds a nest». The cell of the united consciousness of mankind with the expanded brain area is represented in a legend «by a nest of the Phoenix from the noble tree filled with aromatic herbs». This shows that the cell of the united consciousness of mankind includes three previous levels of consciousness – level of consciousness of stars, and also of consciousness of inorganic and organic nature of planets. Self-burning of the bird Phoenix occurs by a laser beam which causes the united consciousness of mankind. This laser beam in the legend represents a sun ray. For this reason Phoenix is considered simultaneously both solar and fiery bird. The image of the Phoenix in mythology of many countries means that all civilization of the Earth should unite consciousness for the Transition and resurrection. Five colors of Phoenix means the fifth level of consciousness, which corresponds to the united consciousness of humanity. Transformations of Phoenix portray humanity transitions from cycle to cycle, the wheel of time. Phoenix and peacock. The bird Phoenix often associates with a peacock. Peacock, as well as Phoenix, is considered a symbol of the sun, and also a symbol of immortality and resurrection, because periodically renews plumage. Each feather of a peacock ends by so-called «an eye». From the point of view of consciousness symbolic each«eye» on feathers of a peacock represents a shift of a brain area in individual cell of a separate human being. Thus, having opened the magnificent tail, a peacock by an ornament of the feathers containing numerous symbols of «an eye», as though tells that the civilization of Earth has made the decision about the unification of consciousness for the Transition. As a result of decision-making on the Transition and consciousness unification in each individual cell of many and many people has been made a shift of a brain area. On Earth exist very powerful organizations and groups which aren't interested in association of consciousness of Earth civilization for the Transition. They have absolutely different plans. Just for them is made the scenario of global cataclysms. However, the first pre-cataclysm’ natural blow will put everything on its place. We are all people of Earth. And regardless of the occupied position and today’ ambitions, none of us has the possibility of individual or group Transition – of a few people - in the next cycle of life. The transition can make only the whole civilization of Earth simultaneously If we, nevertheless, wait till the beginnings of global cataclysms on the planet Earth we will perish all together. Thus, the best way for humanity - to make the Transition in advance, before the first pre-cataclysm, in order not to suffer from its consequences. Extraterrestrial civilizations urge mankind to begin training for the unification of consciousness for the Transition today. Today the most important quality of relationships is understanding of the coming situation, calmness and kindness.